What defines good food for you? Does it have to be plated well, using the latest techniques, and sourcing exotic ingredients? The components are important and so is the culinary skill in making a dish work but there is some level of culture that plays a large impact on how well (or not well) received a plate will be. The memories evoked and the emotions alongside those are all important. For me, Thai food somehow found itself in my realm of go-to comfort foods. 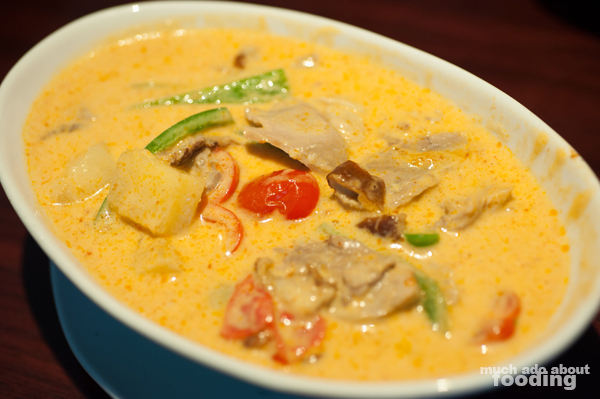 After a long day, I want to settle down with some red curry and tofu, a glass of creamily smooth Thai tea, and a small side of spicy papaya salad. What I don't necessarily expect when those comfort food moments hit is that the food not only satisfies the cultural factor of what makes food good but also the culinary. 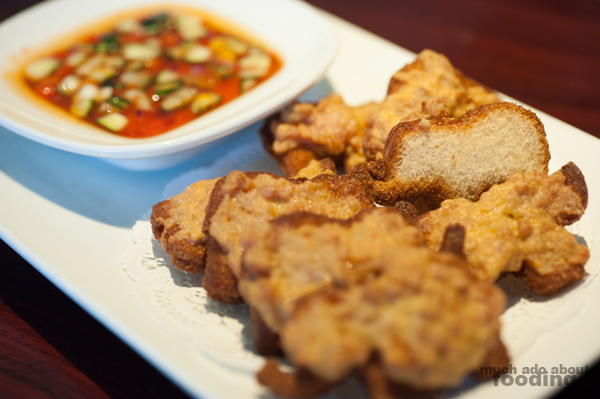 We found that at Ayara Thai Cuisine in Los Angeles though. I had been reading about it every now and then but when we decided to turn a day into an LA trek, we put this on the list and ventured out to meet with them. What a fine decision that was. From the outside, the restaurant doesn't look like one that would serve up fantastic grub but rather, a humble little Thai restaurant. They are humble there but they, by no means, are little in what they do. 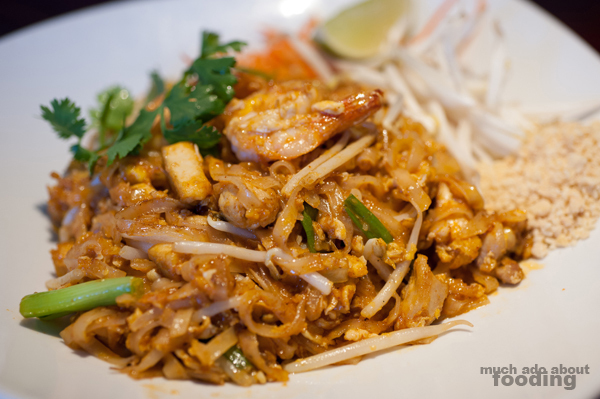 It is not only a community favorite but surely people drive out to get some Ayara Thai action. The restaurant is consistently busy, and the prepped next door building is a sure sign of this activity; it is ready for their expansion plans to finish this year. Already emblazoned with window signage, the neighboring spot will be the home of the enlarged restaurant but for now, enjoy what you can in the original site. The restaurant is endearingly family-owned and run, headed by Andy Asapahu and Anna Asaphu and technically owned by their daughter Vanda Asapahu. 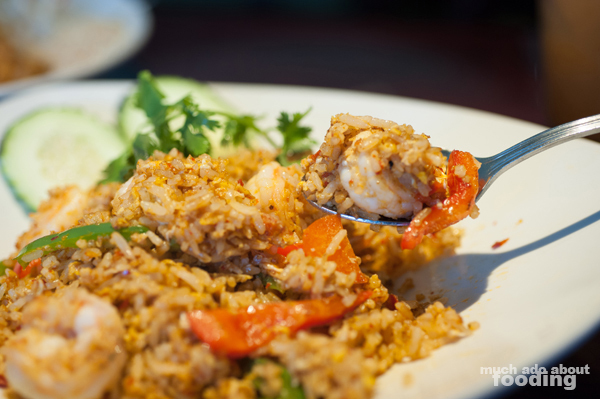 Begun in August 2004, Ayara Thai Cuisine gathered its regulars and fanbase before expanding further throughout the country through their well-known sauces. Because customers had been constantly asking for bottles of the sauces to go because they loved them so much, the restaurant decided to turn that into a business venture and produce the sauces on a more commercial level (though they are still all made in-house by the kitchen). These get shipped out across the nation and for just reason. We tasted all of them and bought a few bottles to take home ourselves! 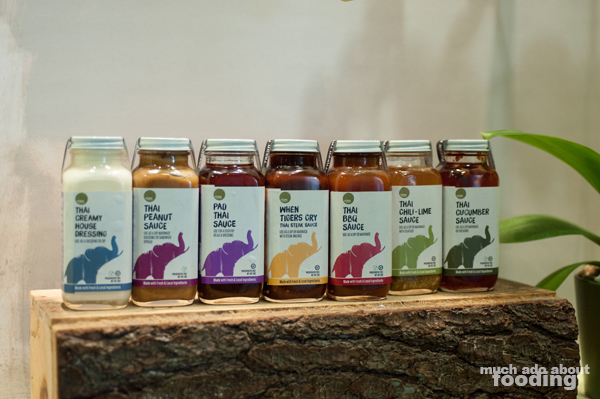 In fact, their Thai Peanut Sauce was recently a finalist in the 2014 sofi Awards for the "Cooking Sauce or Flavor Enhancer" category. The restaurant is focused on family recipes and home-cooked authenticity. Herbs are grown at home when possible to be used, ingredients are seasonal, and just about every component is made from scratch from the sauces to the seasonings. We could taste it in the Thai Iced Tea ($2) and Thai Iced Coffee ($2) we started off with and as the dinner progressed, we could see it in everything we dove into. We had an idea of what we wanted to eat ourselves but we also had to know what were some popular dishes. We asked Peter Asaphu who was helping us out that evening and is a son in the family. The menus came out in a clipboard style (without a clipboard) with pages and pages to choose from so we needed a little advice. For our appetizers, we went with the Fresh Spring Rolls ($8 - shrimp, green leaf lettuce, carrots, cucumber, alfalfa sprouts, egg noodles, and sweet basil wrapped in rice paper; served cold with Ayara Peanut Sauce) in anticipation of what the famed peanut sauce tasted like. The presentation was thought out, and we were surprised that it came out with a whole orchid. The shrimp in these were quite large and cooked well, and the inclusion of alfalfa sprouts gave a good, crisp bite to the roll. 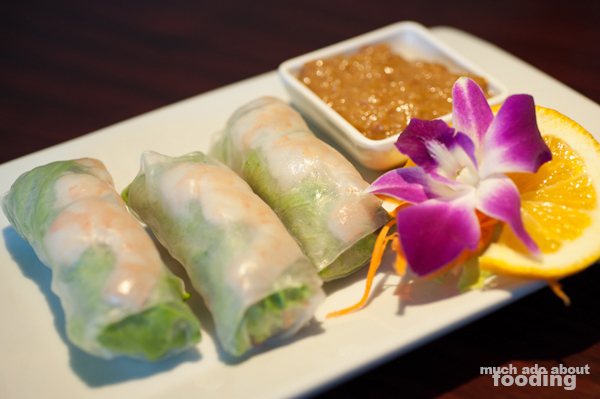 I could tell that they had been rolled to order too because the rice paper was the right amount of moist. As for the peanut sauce, it is different than what other places might serve which is a combination of peanut butter and hoisin sauce; this one incorporated Thai chili sauce as well. It was tangy, savory, and slightly spicy all in one. The other appetizer we went for was purely for the description. Their Ayara's Toast ($8 - seasoned ground pork and shrimp topped on elephant shaped toast served with Ayara Cucumber Sauce) is perfect to order if you have small children at the table or children-at-heart like myself. 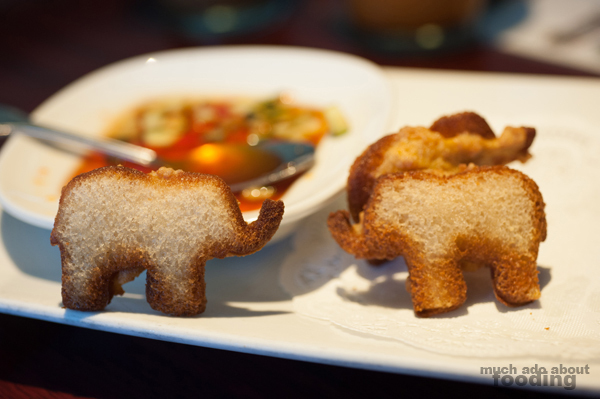 I was so amused by the elephant toast which had the ground pork and shrimp patted onto one side before being fried. They were so darling! The shallow saucer of cucumber sauce reminded me of a watering hole...a tasty one at that. The cucumber sauce was sweet, tangy, and spicy - all the elements that I associate with Thai cuisine. I really enjoyed the presentation on this and the seasoning on the meat patty part was balanced; the only problem with this fun shape is that the trunks and legs will sometimes be more burnt than the body. With the entrees, we had made up our minds on the way over to not order the typical Thai dishes that are present in every restaurant but Peter ended up suggesting some of those anyway. Perhaps it is just a testament to the fact that they can even get the simplest of dishes right. We went with the Shrimp Paste Fried Rice ($11 - creamy shrimp paste, chili, bell peppers, and egg with extra shrimp added for $2 more), The Original Pad Thai ($9 - thin, flat rice noodles sauteed with fresh shrimp, chicken, tofu, egg, green onion, bean sprout, and crushed peanuts), and Roasted Duck Curry ($12 - roasted duck, tomatoes, pineapple, grapes, and bell peppers bathed in red curry coconut milk). Of these three, we only indicated the level of spiciness with the curry which we said to be medium. Perhaps we should have asked about the fried rice because that was tear-inducing! I'm quite sensitive to spiciness though so I would have disregarded the heat on this dish if not for Duc also rushing to gulp down some of the iced tea. However, the heat was a flavorful one, and we masochistically kept on eating it because it became our favorite of the three dishes we ordered. The peppers were cooked to the right texture, slightly softened but with a snap. The rice was neither soggy nor dry. Even the shrimp was succulent. Peter had explained that the pad thai was done a little different at Ayara Thai than other restaurants may do it, and we spotted the difference on our first bite. It was a little sweeter than other versions. I did also notice that the noodles were done to my preferred level of doneness which was harder for Duc than he preferred. To each their own when it comes to noodles, I say. There was no greasiness to it for which we were glad, and the overall sauce was pleasant. When we had ordered the curry, it was merely out of curiosity. Who puts grapes in their curry anyway? I looked for those the moment we got the bowl, and there they were, all skinned and floating in their glory. Their inclusion all made sense, however, once we actually ate them with the curry. A normally spicy and long-lasting dish, the curry can have its heat dimmed a little with the naturally sweet fruit globes. I can't describe it in any other way than to say that the "icy" feeling of popping a grape in your mouth carried across through the heat of the curry. Luckily it was not too painful at the "medium" level, if even present. I loved how rich and creamy the curry was, luscious in its own right. The duck, however, came off just a tad too gamey for the type of curry it was in. We enjoyed it overall but of the three, it was our least enjoyed. We were quite full at this point but in the interest of getting a full scope of the menu, we stuck it out for dessert. Mango sticky rice seemed too heavy but a scoop of ice cream was deemed appropriate. 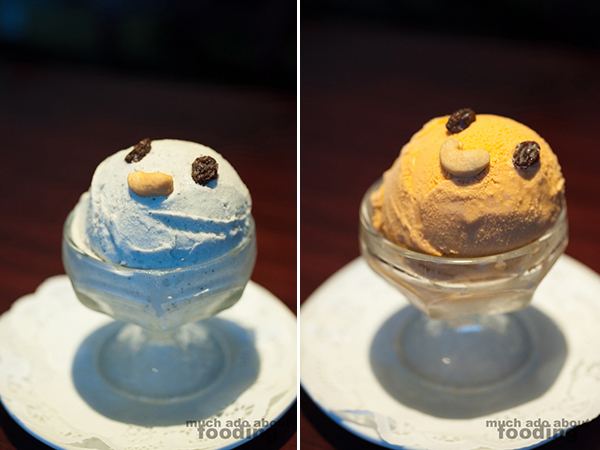 Their Scoop of Ice Cream ($3) came with many options: traditional Thai coconut, green tea, red bean, mango, lychee, Thai iced tea, and black sesame. Have I gone to heaven? Those all sounded amazing. We inquired further on where we could even get these outside of the restaurant but apparently they do source from a small local business who does small, small batches. Darn. We went for the Black Sesame and the Thai Iced Tea which Peter promised was exactly like the drink itself, not an imitation or inspiration of it. They were both presented endearingly with faux faces made from raisin and cashew. It's a shame that I couldn't buy a gallon of the ice cream though because I fell in absolute love with the black sesame. It was so thick and creamy that every spoonful pulled upward with the tenacity of a child not wanting to let go of its favorite toy. Arching waves of ice cream fell upon themselves when I removed the metal utensil from the mass. I nearly hoarded the entire scoop to myself. The Thai iced tea did not disappoint either - it tasted exactly like the drink, as Peter had promised. It, however, did not have the same texture as the black sesame and was a little icier so we favored the former. 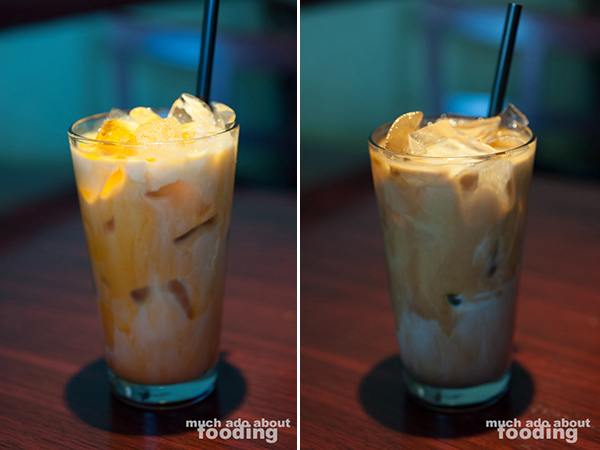 I loved how genuine the flavor was though and could see it being a fantastic favorite for the Thai iced tea lover. Overall, we truly enjoyed our experience there. The staff were great with every guest from what we saw and very courteous. We learned that the commitment to quality and authenticity reached as far as hiring recently immigrated Thai cooks who were trained in the Asaphu style of cooking; if they didn't make the cut or meet Anna's standards, they were let go without a second thought. It's clear that they only allow the best, and their constantly full tables is a testament to this fact. 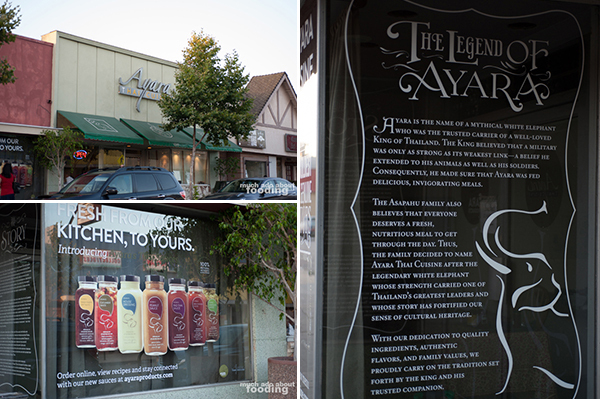 If you want to check them out for yourself, they are located at 6245 W 87th St, Los Angeles, CA 90045. Please note that they will be remodeled in the fall to expand their restaurant so will not be completely open. They do have a back-up plan though; there will be a limited menu food truck in front of the restaurant during the construction time. New additions for the remodel include the first U.S. Thai Noodle Bar and Open Kitchen with additional seating, a full bar, and open kitchen as well as a noodle bar.